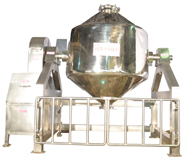 We offer Double Cone Blenders that are of high efficiency and ensure homogenous mixing of dry powder and granules. 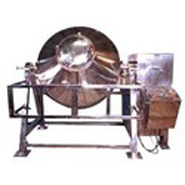 The conical shape of double cone blender at both the ends helps uniform mixing and smooth discharge. These double cone blenders are preferred by clients in pharmaceutical, Food, Chemical and Cosmetic industry. We take utmost care to ensure that the operation is safe and that is why we have equipped the unit with an operational timer. Powder can be loaded through a wide opening and the discharge can be collected through a mucon valve or a slide valve. Double Cone shaped with cylindrical Shell at Center, & conical shape at both ends. Well balanced to avoid any excessive load on gear box or motor. Paddle type baffles can be provided on the shaft for better mixing. Charging and discharging is through a butterfly valve. A conical adaptor can be provided for fixing charging drum after butterfly valve. Unit can be provided with bin charging arrangement. A safety railing with a limit switch is provided for operator safety. Flame - proof motors / Limit switches with flame - proof push button stations can be provided. Available Models from 5 Litres to 10000 Litres. Contact parts in stainless steel AISI SS 304 or 316.